I’ve been using Google+ for a week now, and in case you haven’t heard about it (as it’s still invite-only, and they are limiting invites) Google+ is a pretty much a competitor to Facebook, and to a lesser extent, Twitter. Yup, there’s a new entry in the Social Networking World. So how is it so far? I’m really liking it. Part of this may be because it’s not Facebook. Facebook has a lot of annoying features, and (here’s the honesty!) a lot of annoying people. I can say that because I may be one of them. ;) Facebook does have lists that you can put people into, and you can then view just the posts from people in those lists, but over the past few Facebook “upgrades” they’ve made lists harder to find, and harder to manage. 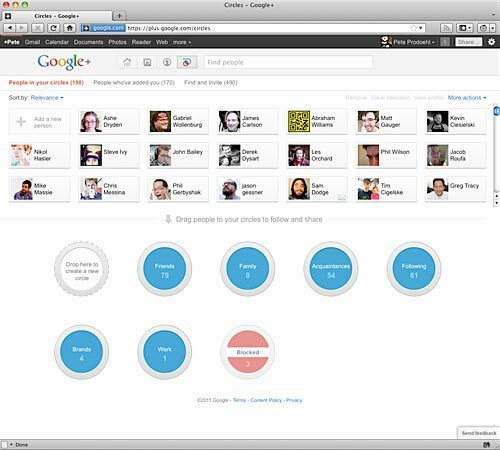 In contrast, Google+ has “circles” which you can put people into. In fact, the circles are a primary feature of Google+, and you pretty much need to use them, unlike Facebook’s lists, which most people probably don’t even know exist. 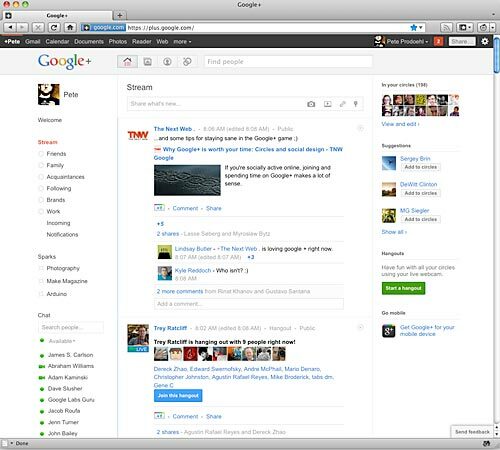 One of the running jokes on Google+ is that all anyone talks about is Google+. I think that was true at first, but I’m seeing more and more people use it like they would Facebook, or any other “sharing” platform, though right now it does seem very tech-heavy, and I’m seeing more web-related things than cat-related things. I’m sure as they open up that will change a bit. 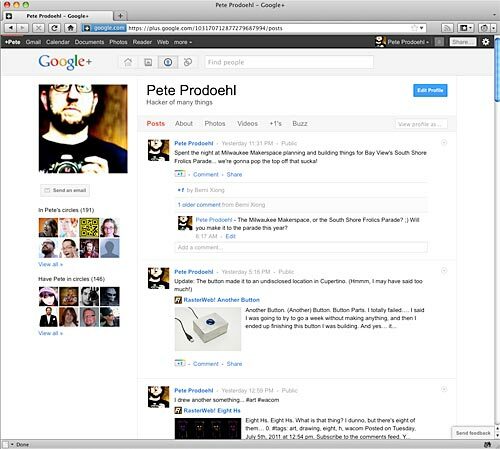 If you visit someone’s profile on Google+ it’s sort of like your wall on Facebook, except it’s the stuff you’ve posted, and not what other people have posted on your wall, so you won’t see goofy posts from your friends who installed some quiz application which them spammed your wall. That’s nice. So far there are no applications in Google+, so for your FarmVille addicts, you’re out of luck… no games! There’s also not really any brands yet. Well, there are, but they are sort of cheating the system to do it. I’ve read that Google will be rolling out business profiles/pages, but haven’t yet. (It’s only been a week!) There are also no events, so if you want to create an event and invite people in your circles, you can’t really do that yet either. The desktop versus mobile experience differs a bit right now as far as everything you can see and do. If you’ve got an Android device I’ve heard a lot of good things about the client, and there’s a iOS app awaiting approval from Apple. If you’re already on Google+ you can find my profile here. Welcome Account Executive Jodi Everts! Club z2 – X – Thanks! Is it “fleshing out” or “flushing out”?